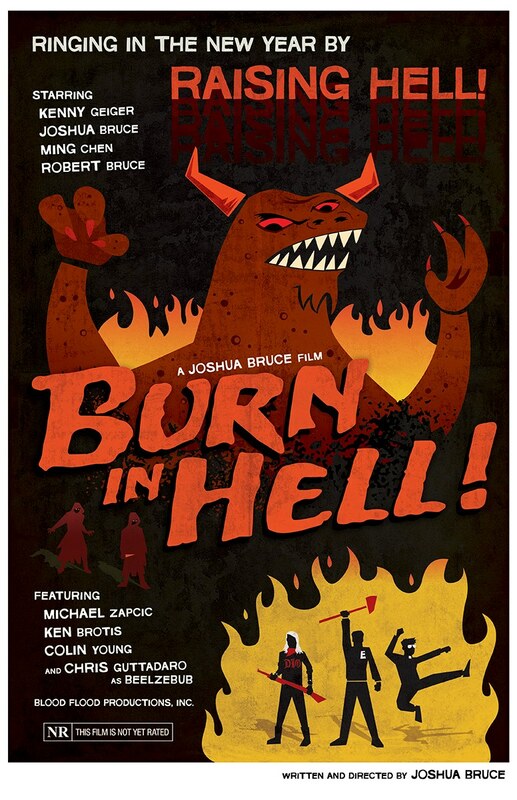 Comic Book Men actors star in indie horror-comedy Burn In Hell. 17-year-old director Joshua Bruce nearing end of production Blood Flood Productions is proud to announce its inaugural feature, Burn In Hell. In addition to Ming Chen, Michael Zapcic and Robert Bruce, the cast is rounded out by Kenny Geiger, Joshua Bruce, Ken Brotis, Nick Petito, Johnny Dickie and Chris Guttadaro as Beelzebub. The low-budget film pays homage to the grainy and gory genre flicks of the VHS era. In it, a high school jock enlists the help of a pot-smoking metalhead and a deranged, one-eyed priest to hunt down a flesh-eating demon and send it back to hell. Burn In Hell is currently nearing the end of principle photography. It is expected to be released on DVD and VHS later this year. Synopsis: In a small town, gruesome killings have been plaguing the townspeople. Bodies are found torn apart and eaten. The authorities have no leads. After the death of his best friend, a young high-school football player, Brad, seeks out the help of local priest Father Damian, who is slaughtered by the killer before disclosing any information of the killings. The killer, revealed as the demon Beelzebub, sets out on a vicious killing spree to consume a steady supply of human blood in order to maintain a physical form. Brad recruits metal-head/stoner kid D.O. to assist him in his hunt for Beelzebub. Guided by the deranged, one-eyed demon hunting priest Father Lewis, the trio set out to rid their town of the demon and end its hellish conquest.